VFL: Reid, Witts return in win Hear from Ben Reid and Jarrod Witts as they continue to progress from long-term injuries in Saturday's VFL practice match against North Ballarat at Victoria Park. Darcy Moore has been named best on ground for his performance against the Roosters. Collingwood’s VFL side has completed its 2015 preseason in style as it defeated North Ballarat by 26 points at Victoria Park. With the match a curtain raiser for next week’s round one clash against the same opponent, there were a number of strong performances as the Magpies overcame a six point Roosters lead at half time. First year players Darcy Moore, Matthew Goodyear and Jordan De Goey were named in the best, as well as Nathan Freeman, Ben Moloney and the returning Ben Reid. Jarrod Witts was dominant in the ruck, while Sam Dwyer won possession at will in the first half before departing to be on standby at Etihad Stadium. The hype surrounding Moore continues to grow after he was best on ground for the second consecutive week. Playing alongside a fit Reid in the backline, Moore’s intensity was a level above the rest as he combined a strong skillset with ferocious attack on the football. Coach Dale Tapping had nothing but praise for Moore’s performance post game. “For a young boy, he’s really mature,” Tapping told reporters. In what was a low scoring clash and at times scrappy first half, Reid believes the backline set the tone for a Collingwood victory. He was also encouraged by the form and development of Moore. “The first half was a bit scrappy but in the second half we got it on our terms a bit more and we were able to come away with a good win,” Reid told collingwoodfc.com.au. Despite a strong AFL presence in the Collingwood side, the Magpies VFL listed players proved their worth under perfect conditions at Victoria Park. Tim Allan and Jake Williams combined for five goals in the second half, while ex-Gold Coast Sun Jeremy Taylor found plenty of the footy as North Ballarat failed to match Collingwood’s intensity. The third quarter belonged to the Magpies as they kicked five goals to one to set up a 19-point three-quarter-time lead. The preseason has been a revelation for Williams. After being named in the VFL Academy squad in March, the 21-year-old has found the scoreboard and been amongst the best players on several occasions. With AFL-listed players constantly arriving and departing the midfield based on selection, the consistently of the likes of Williams, Ben Moloney and Jack Hellier will be crucial when the regular season commences next weekend. 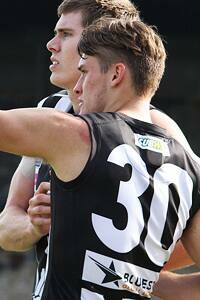 It’s not uncommon for the VFL change-rooms to be abuzz with activity after a win likes todays. However it quickly became a ghost town as attention quickly turned to the afternoons AFL clash against Adelaide. With the AFL season well and truly underway, there is no doubt the VFL Magpies will counting down the days until next Sunday’s clash against the Roosters in Ballarat.